If you want to try something really new, unique and full with adrenaline, you should choose Riga dolphin jetpack. It is perfect for water sports enthusiasts. You will be strapped into a pair of shoes attached to powerful water jets and fly up to 12 meters on surface of the water. After few minutes you will find a balance and begin to experience the indescribable feeling. You'll be able to perform incredible acrobatic stunts. Dose of adrenaline for each flight! 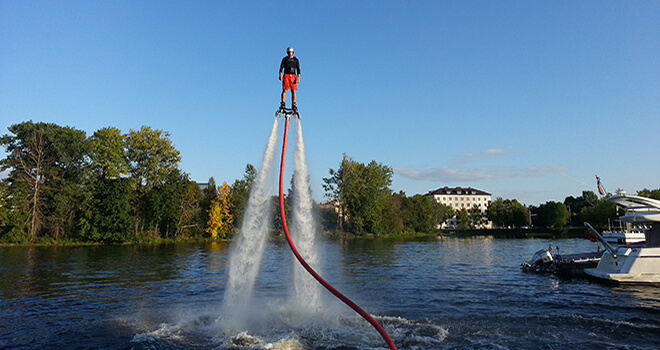 We will pick you up from your hotel and after 15 minutes you will be near the Daugava river where the JetPack takes part. This is something new and extraordinary. If you love water and adrenalin than this is exactly for you! There will be an instructor who will help you at the beginning, but after some time you will understand how to control JetPack by yourself. You can feel like a real superhero and fly through the air.